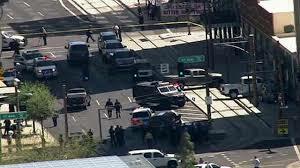 A pursuit of a violent felony suspect in the heart of downtown Phoenix on March 18, 2014 ended in yet another deadly force encounter in which Phoenix Police had to engage a suspect with gunfire to end an ongoing and imminent deadly threat to citizen safety. This incident occurred a little more than one week after Detectives John Hobbs, AJ Casado, and Mike Miller were involved in a violent gun battle with a felony suspect at 43 Avenue and Bethany Home Road resulting in the death of Detective Hobbs, and serious injury to Detective Casado. In the face of this increasing violence city officials are still advocating for a 3% wage and benefit cut to police officers. The Phoenix Police department has not made any significant progress in hiring during the last five years yet still loses manpower month after month due to normal attrition. This combination of factors has created a deficit of approximately 500 positions. Severely strained manpower combined with a city government that wants to continually cut officer pay and benefits makes for a dangerously understaffed and demoralized police force. It would seem some expect rank and file officers who take on the greatest risk to continue to bear the increased burden of balancing the city’s budget. CLICK HERE for the news story featuring ASU professor and retired PPD Commander Jeff Hynes tlaking about the reasons for the uptick in violent crime.